Troy Tomlinson and Josh Van Valkenburg speak to students at Columbia Studio A at Belmont University in Nashville, Tenn. September 13, 2017. 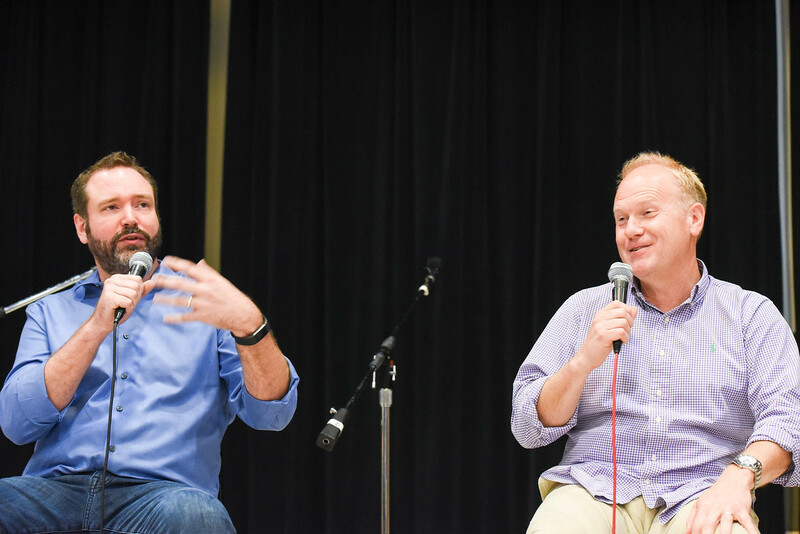 Sony/ATV Music Publishing Nashville President/CEO Troy Tomlinson and Senior Vice President of A&R Josh Van Valkenburg spoke to a packed house of Curb College students in Columbia Studio A on Wednesday, Sept. 13. As part of the seminar conversation, the two announced the fourth annual Belmont Sony/ATV Music Publishing All Access Program that allows any Curb College student to submit their music to the company for review by their creative team. Van Valkenburg assured the students that they watch every video submitted by students. The Sony/ATV team will select a group of about six students they want to hear perform live later in the semester. The program has given the opportunity to several students to sign a music publishing deal with the company in previous years. In addition to his role as a music executive, Tomlinson is also a member of the Belmont University Board of Trustees.